Hi there, I hope you’re having a fantastic weekend! Speaking of moving (you like that seamless transition? 😉 ), would you agree that it’s equal parts exciting and torturous? Once you’re finally in and settled it, it’s amazing, but getting to that point, not so much! Whenever I’ve moved I’ve experienced such kindness from people. From lending their muscle power, to driving a last minute load in their car, to helping paint or even just offering moral support, I was so appreciative! There are so many ways to congratulate someone on their new move (many of which require no manual labor). 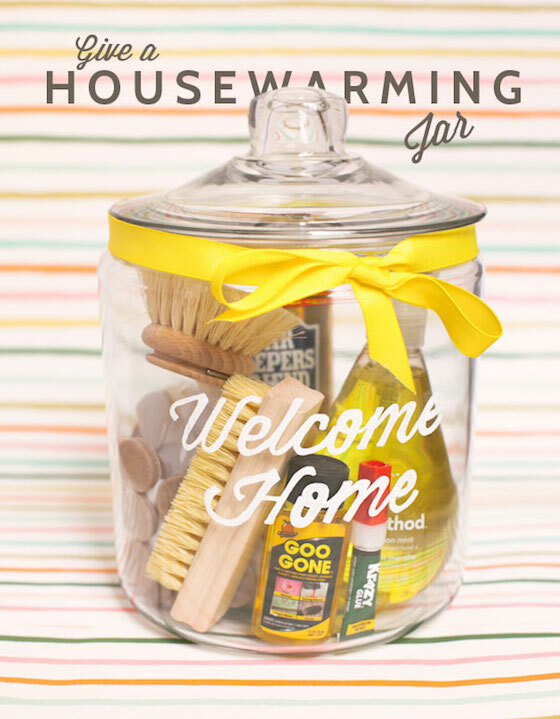 These housewarming gift ideas require no Advil the day after. One of the worst parts of moving can be the food situation. You suddenly realize you’ve been moving/unpacking, etc. all day and that you’re starving; pots and dishes whereabouts unknown. You decide that someone will have to run out for Subway. You really don’t want Subway. You’ve worked hard all day and what a good, home cooked meal. Then your friend arrives (as if from heaven!) with a week’s worth of meals, all ingredients included, perfectly portioned and housed in a gallon size Ziplock bag with cooking instructions (courtesy of her heavenly counterpart, Hip 2 Save) ready to heat up or dump in the crock pot (when you hopefully unpack that later tonight). She truly thought of everything! She brought a pot to borrow, paper plates, plastic cups (or bonus points for earth friendly reusable plastic ones! ), plastic silverware, adorably wrapped in napkins (like these ones from One Swell Studio), in an ice bucket to use for your upcoming housewarming party! Wouldn’t it feel great to be this lifesaving friend?! 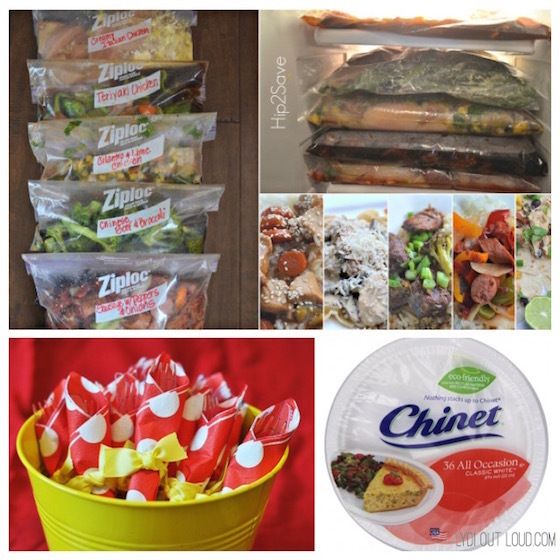 And btw, these meals take less than an hour to prepare! I love these all occasion cards! They would come in so handy for those times you realize you need a birthday card, a congratulatory card, a thank you, etc. and don’t have one! 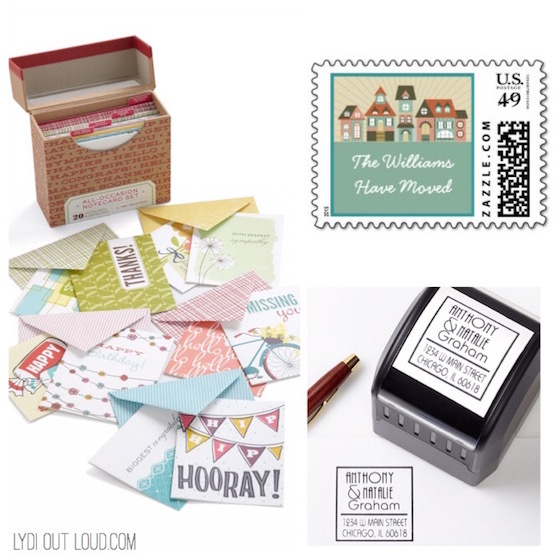 This cute variety pack covers all the bases, along with custom personalized postage stamps and a self-inking address stamper with the new address make a unique housewarming gift. We got this personalized ornament for Christmas last year and I love it… I didn’t even want to put it away after Christmas was over! 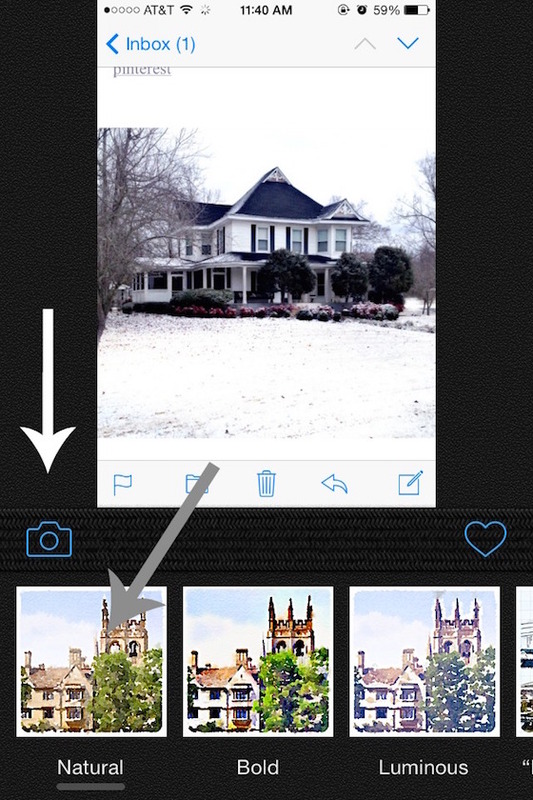 It can be created with or without the photo, and the text is completely customizable. A small potted herb (how presh is this DIY garden marker from Wit & Whistle?!) 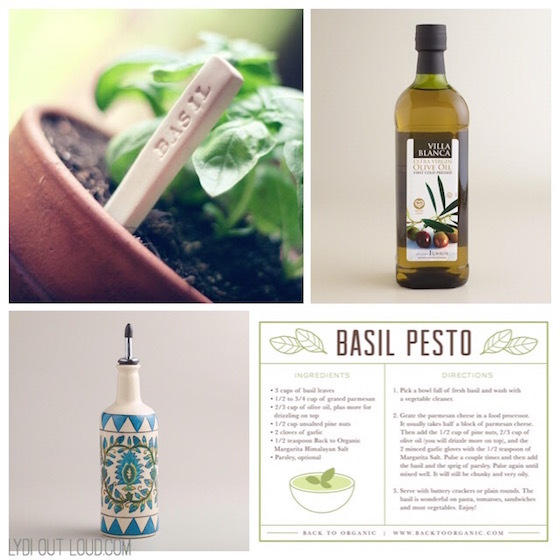 is a great gift idea (we’ll go with basil here). 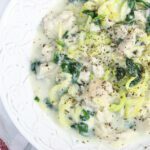 Accompanied by a favorite basil recipe (this basil pesto recipe by Back to Organic is phenomenal! )a nice bottle of olive oil with a beautiful oil bottle is a simple, yet elegant gift idea. Waterlogue is such a cool app! You upload a photo (in this case your gift recipient’s new abode) and it transforms it into a beautiful watercolor, worthy of printing and framing (and of course sharing on all of their social media outlets). Since we have moved outside of the city, I have so enjoyed observing all of the birds in our backyard and hearing them sing. 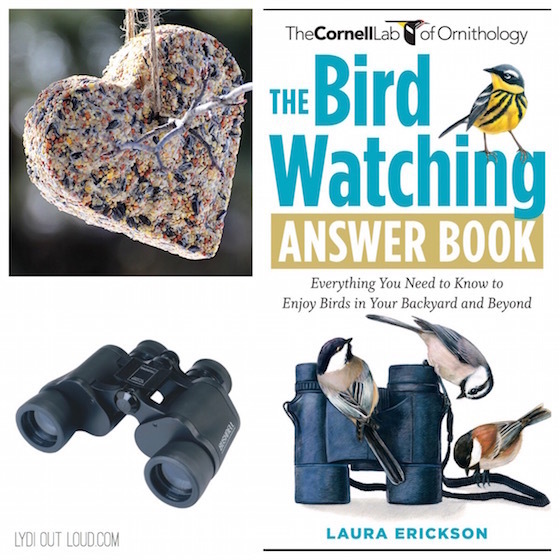 These DIY bird feeder cakes, a bird watching book and some compact binoculars for bird peeping would be perfect for those moving into a place where they will spend a lot of time outdoors. 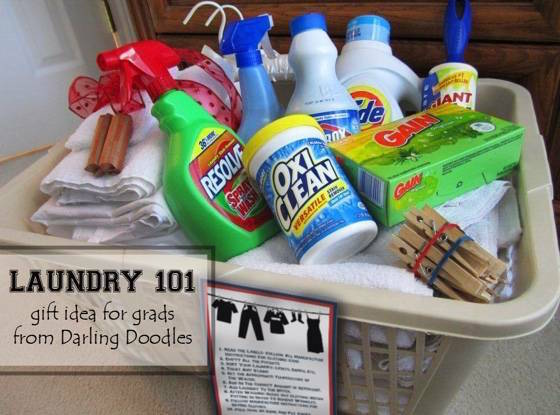 This laundry basket full of laundry supplies with a cute printable from Darling Doodles would be a great gift for a recent grad or anyone moving into the first place of their own. 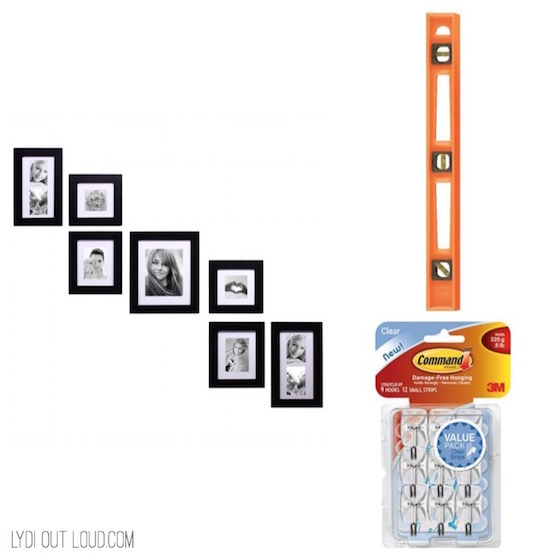 This little kit is instant an instant gallery wall with a frame set, a level and my favorite invention, Command picture hooks. 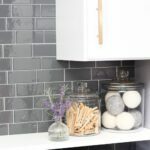 With these hooks you can change your mind and change the picture location without getting a crater filled wall as a result (especially if you’re as indecisive as I am! ).This is an ideal gift because going out to buy picture hangers is not on the top of the priority list after a big move, but gosh hanging some pictures instantly makes a house feel a lot more like a home, right?! Do you know of anyone moving anytime soon? 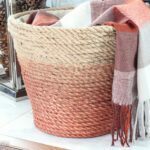 If so, I hope this round-up will give you some ideas to work with! Where is the ordament from? Hi Stephanie! It’s from Personal Creations but I just checked their site and it looks like they don’t make that style anymore. 🙁 You might try etsy for something similar. Sorry about that! Thanks for the nifty ideas. I’m a bird watcher (aka birder) so I really appreciate the ideas you gave for that hobby. My other hobby is playing board games. A game could be a cool gift too. Thanks so much Gary! I’m glad you enjoyed them. I agree, games always make a great gift idea! 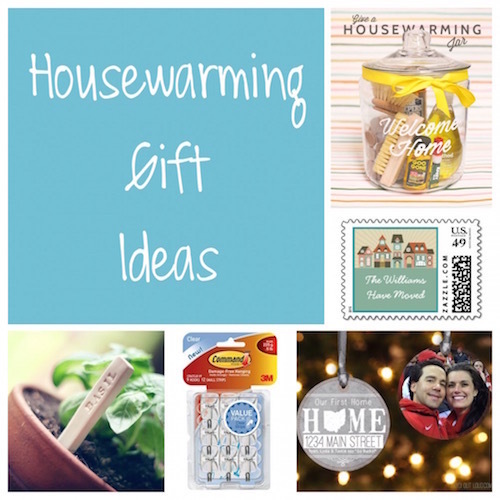 Such a creative list of gifts for the new neighbors or friends that are moving. I really enjoyed these creative ideas! I know the meals would be especially appreciated and allow time to get settled the entire week!